Tonight, I just received the highest praise I could ever ask for. Hubby asked me if I wanted to get rid of him. My reply was was a resounding "Not at all" then I asked why, was he wanting to get away from me? He looked straight at me and said, "I'd be in a world of hurt without you". That is so sweet! Congrats on being published! Congrats btw on being published! Sending smiles and prayers your way! I may never hear it again and I can't even remember if I've ever heard it in our 30 yrs of marriage but I'm treasuring this moment for a very long time. 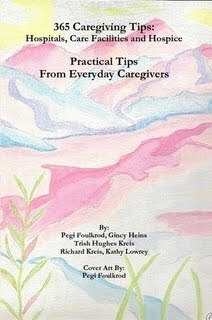 TY also for acknowledging the caregivers Help book. It was a pleasure to participate in something that will benefit other caregivers not only by it's words but by the Caregifters fund it will supply. 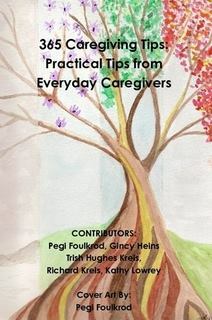 By the way, any caregiver that has a funny caregiving story is encouraged to participate in the next of the series. Think about it, will you? I am a caregiver for a patient with Lewy Bodies Dementia. I am wondering if I could have your permission to print your blog to share with the other caregivers? It is amazing to read your journey. I am touched. I appreciate that you would like to share my journey with Lewy Body. When I first started out, there was little information to find concerning what others were going through and dealing with. I found tech information in medical terms but really wanted more of the human experience I could relate to. I started this blog as a way to do a little "self help" and maybe share with others looking for the same thing I was. If you feel like it would benefit others please feel free to share this blog. This is so special. It was reported to us two wife caregivers that another husband was sitting between my husband and "Jake". Both my husband and Jake went on and on about us wives how they loved us and would be lost without us. Both my husband and Jake, though, couldn't remember our names! Learned this on Valentines Day and it made our day. Thank you for that HUGE Smile. I can SO relate! LOL!!! Times like this make everything worthwhile... What a gift! Yes!! A wonderful gift to get. I've also ordered materials to distribute to Hubby's Home Health Agency in hopes that they would do an inservice for their employees and educate others about Lewy Body. They have expressed interest in having these material YAY!! !